This post is written by Humza Ijaz is a Digital Creative Director, currently working @ LBI. His interests include: Designing for Web, Looking out for new technologies and has a new hobby of studying information design. I discovered two great things yesterday which helped me clear out lot of confusions in my head regarding the “iPad” topic once and for all. Firstly, my good friend and colleague Imthiaz Rafiq @hmimthiaz posted a great article relating to all the bad press iPad has been receiving in the Middle East region – please have a read here. Secondly, while looking for some “social technology” presentations which is a recent buzz word I have been interested in – I came across a very interesting “Social Technographics” presentation which explains the “Social Computing Behaviors” of consumers in todays day and age. Have a look here. Now – lets talk about the purchasing behavior. If I am in the apple store, with this device in my hand, looking at it, thinking to myself: How can I justify spending the money to get one of these things? So what is the iPad really? “It’s Gonna Change The Way We Do The Things We Do Everyday” said by Phil Schiller, Senior Vice President World Wide Product Marketing over at Apple when speaking about the new Apple iPad. 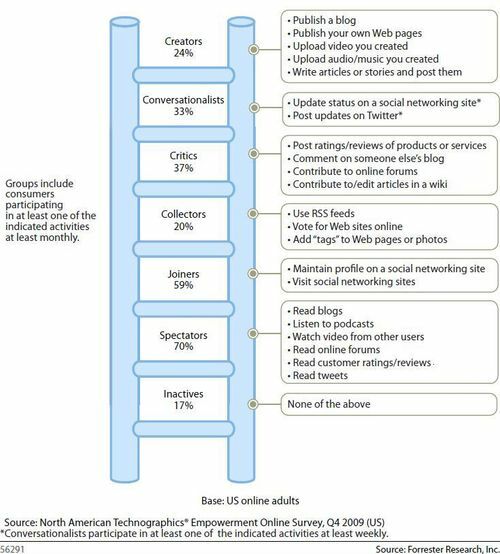 The chart below shows how different people interact with social technologies which is the “ladder” approach I believe apple is taking as well. Starting from designing for the “content viewers” to essentially the “content creators” after ever generation release. To conclude, I wouldn’t call this an “innovative” product just yet! It is still a creative product to me but once put into practice and made use of by millions of people around the world, consuming apps etc, then it will make it to its mark. Would love to get feedback from everyone on what are there views on this new device? The key word is ‘carry’. If you’re going to carry something that does NOT fit in your pocket anyway, would it rather be a half-functional or a fully functional one (i.e. a notebook)? Device came out, people bought it – then after a few months everyone on the train stations and buses seems to have them, cause it solved a problem to a long tedious journey and made it a bit more of a pleasant experience. Came, we were so unsure of what to use it for but the product looked like it had potential. But we only saw potential once we started doing more than 80% of our quicks "hands on" online activities on it and it replaced out notebooks for us. Will potentially change the way we read content online and interact+spread it around. hahah would still love to hear back why you didn't seem to agree, maybe you will help change my perception. True, Yes it is very relative. There is not a single product which can make everyone happy. Apple is not claiming that iPad as one such device. People are talking so much about it and making it a cool product.